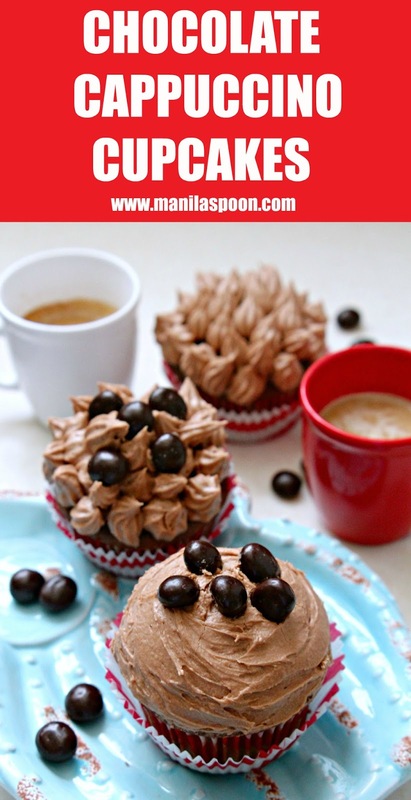 A delicious burst of coffee goodness in every bite of these Chocolate Cappuccino Cupcakes with a luscious espresso-flavored buttercream frosting! Perfect pair with your morning coffee! Last month we went to England and visited some family and friends. We stayed with my mother-in-law who has a lovely house overlooking the Norfolk Broads. My favorite thing to do when there is simply relax enjoy a cup of tea or coffee and enjoy the lovely scenery by the window. I do have lovely memories of my father-in-law and, recently, my mother-in-law serving us with a delicious homemade espresso-based drink, whether it be a cappuccino or latte, all with a delicious helping of something sweet if we wanted some (there’s always a yummy treat in that house!) and we all felt like we were in 5 star accommodation indeed! You see my parents-in-law owned this lovely little machine that allowed them to make espresso at home in a breeze and entertaining became easier for them having that especially when unexpected guests arrive and we had some while we were there. Anyway, since then I have always wanted a little machine like that! Finally, almost like an early Christmas gift, we got our own little espresso machine called Nespresso. And I certainly got it working as soon as it arrived! Since I love espresso-based coffee drinks, I wanted to write a recipe for the blog that features coffee, naturally. I know for sure that chocolate and coffee are a great flavor combo as coffee compliments and truly enhances the chocolate flavor in any dessert. I have made cakes with coffee before but never really tried making coffee flavored cupcakes. I thought it’s about time I try, after all I have a handy machine for it and a delicious coffee to use in making it! And so it was born….the Chocolate Cappuccino Cupcakes – moist and yummy cupcakes flavored with cappuccino (espresso and a little milk) with a totally luscious Espresso Buttercream Frosting! In making these delicious cupcakes, I used Gourmesso Coffee Capsules which are perfectly compatible with our Nespresso machine. Yay! Not only were these coffee great to drink as an early morning pick-me-up, they are perfect to use for making coffee-flavored desserts. I wanted just a subtle coffee flavor on the cupcakes themselves so for that I used the Gourmesso Soffio Vaniglia as I loved its milder taste and the hint of aromatic vanilla. For the frosting, I wanted a pronounced espresso taste and I couldn’t have chosen a perfect espresso flavor for this – the Gourmesso Colombia Arabica Mezzo – it totally gave a delicious explosion of coffee flavor in the frosting without overpowering it! 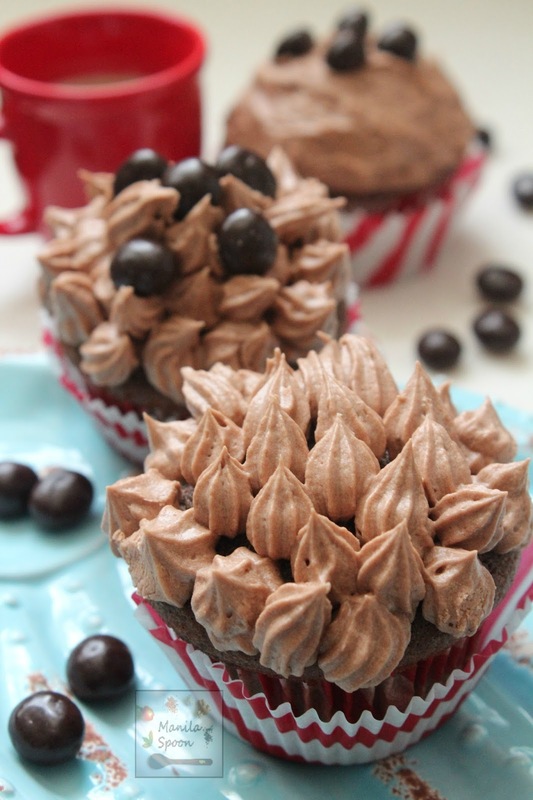 With just one shot of espresso in the frosting, it totally brought these cupcakes to another level of yumminess! I had a lot of fun making these cupcakes and especially when it came to frosting! I played with my pastry bag tips and enjoyed making all that yummy swirls all over. Of course, feel free to simply frost the cupcakes with a quick stroke of the spatula as I certainly did, too. The point is to enjoy it and have fun with it and be as whimsical as you want! And with that delicious espresso flavor in the frosting you can be sure I will be making these cupcakes often!! 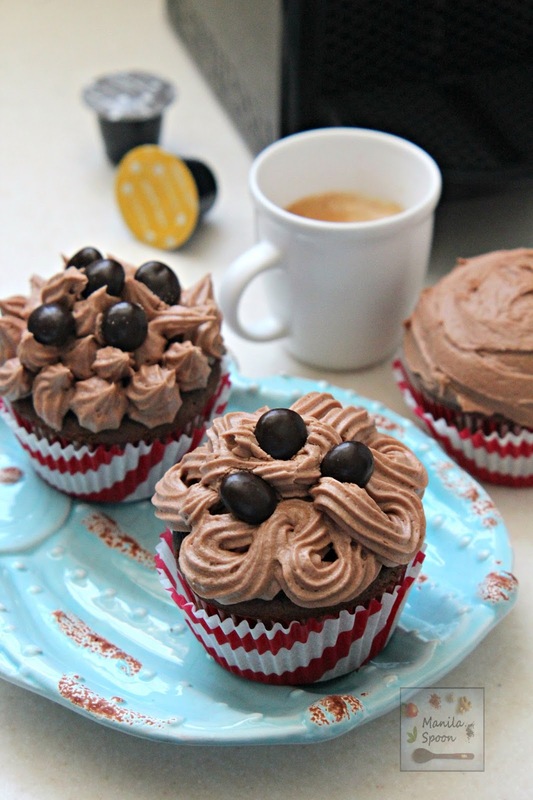 Delicious and moist chocolate cupcake flavored with your favorite espresso – cappuccino! The perfect pair with your morning coffee! Preheat the oven to 350 F. Line a 12-cup muffin tin with cupcake liners. Sift together the flour, baking powder and cocoa powder in a bowl. Set aside. In a mixing bowl, beat the eggs and sugar using a stand mixer with a whisk attachment or a handheld mixer until light and fluffy for about 1-2 minutes. Shift to the paddle attachment if you are using a stand mixer. Slowly pour the coffee, milk and and oil to the egg mixture and mix gently until everything is combined. While the electric mixer is on, slowly add in the flour mixture (a little at a time) to the wet mixture stopping occasionally to scrape the sides. Mix well until fully incorporated and smooth but do not overbeat. Divide the batter evenly into the prepared cupcake liners using an ice cream scoop. Bake in the preheated oven for about 20-25 minutes or until a tester inserted in the middle comes out clean. Leave to cool in the pan for about 5 minutes then transfer to a wire to cool completely. Decorate with some Espresso Buttercream Frosting on top. Take the butter out of the fridge and leave it on the counter for 30-60 minutes to soften. Place the softened butter in the bowl of a stand mixer with paddle attachment (or in a mixing bowl if using handheld electric mixer) and beat at medium speed until smooth. Lower the speed then slowly add the icing sugar and cocoa powder until combined. Lastly, add the espresso and milk and beat on high until everything is mixed well and the mixture is light and fluffy. Add a little more milk, if needed. Spoon the buttercream into a pastry bag and using a star tip or your favorite tip, pipe a swirl onto the top of each cupcake. Be creative and make your own type of swirl. 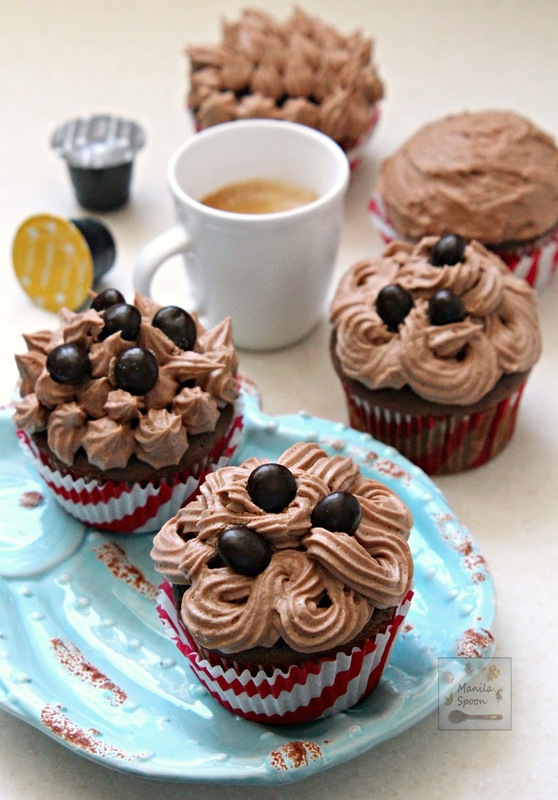 If desired, decorate with some chocolate espresso covered beans on top!